Anecdotal evidence suggests that the first week of trading in the new year provides a hint of what's to come over the balance of the year. In my own investing, I rely more on fundamentals than technicals, but with this past week's strong rally (S&P 500 up 3.0%, DJIA up 2.3%, and Nasdaq up 4.5%) ushering in the new year, I couldn't resist the temptation to spend a few hours over the weekend examining pure price behavior. Question: Is a rally during the first week of trading in January a bullish sign for market performance over the remainder of the year? 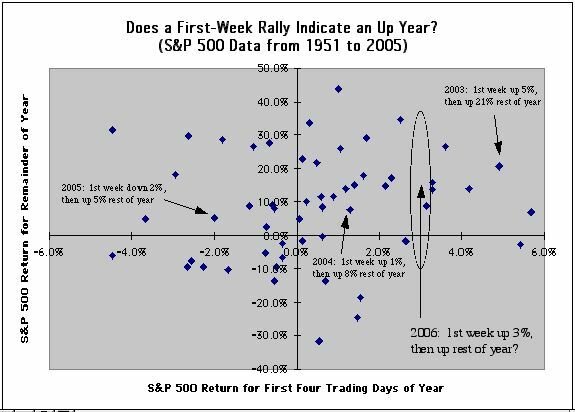 When opening-week returns have been above 2%, remainder-of-year returns have been positive (i.e., greater than zero) 83% of the time. 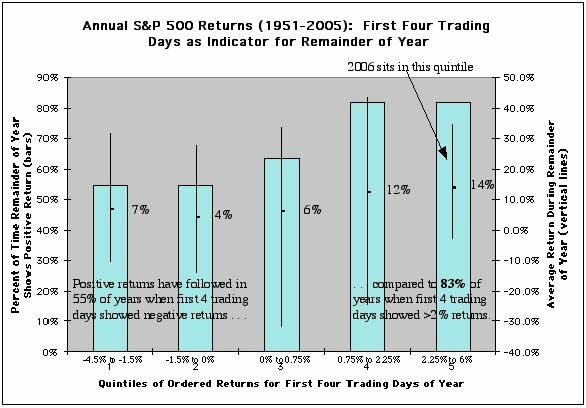 On the other hand, negative opening-week returns have been followed by positive remainder-of-year returns a significantly lower percentage (55%) of the time. 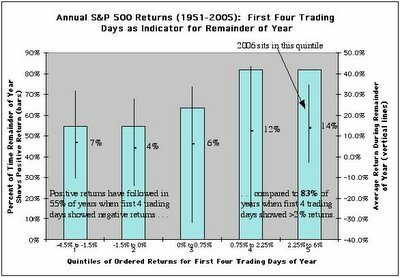 With the first week of trading this calendar year (2006) having exhibited an historically strong performance (only eight of the 55 years between 1951 and 2005 have seen S&P 500 returns exceeding 3.0% over the first four trading days), the balance of the trading year should be up as well--assuming the past offers some guidance on what we might expect in the future.